In an important move, the apex body of several tribal and forest dwellers’ organizations, Campaign for Survival and Dignity (CSD), in alliance with Congress, Janata Dal (United) and Left parties, has strongly opposed the reported move by the Prime Minister’s Office (PMO) to “allow” mining in the forest areas without taking the consent of the local villagers. The convention, in which delegates from Rajasthan, Gujarat, Maharashtra, Madhya Pradesh, Chhattisgarh, Jharkhand, Orissa, Tamil Nadu, Uttarakhand and Himachal Pradesh participated, also saw leaders of the Telengana Rashtriya Samiti, Bahujan Samaj Party, CPI and CPI (M-L) Liberation sending in their statement in support of the move to condemn the NDA’s "efforts" to undermine tribal rights. While Shakar Gopal Krishna, secretary, CSD, spoke about “illegal grabbing of resources and lands” pointing to how the Central and State governments are “failing to recognise people's rights over forest lands”, the opposition parties "sought solidarity" of civil society. 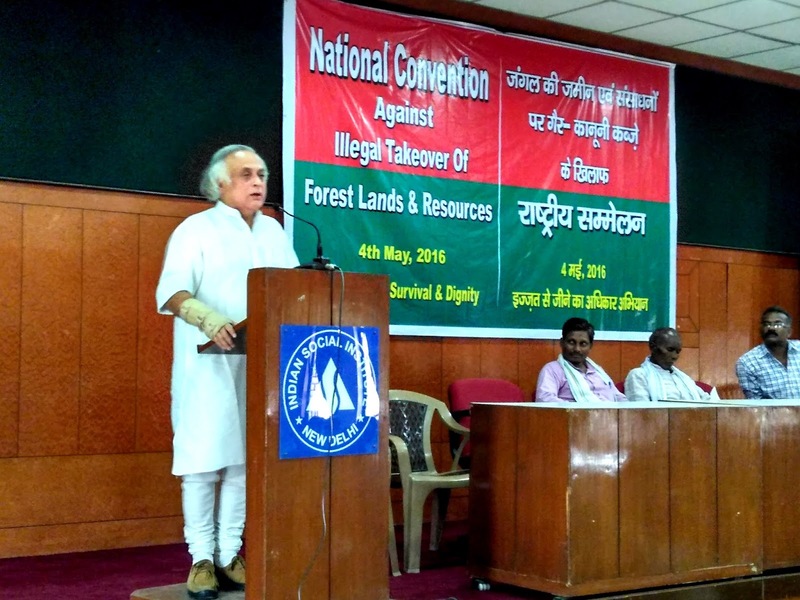 “The Central government is facilitating the illegal takeover of forest land by encouraging diversion of forest land without gram sabha consent, plantations on people's lands, and by funding of parallel institutions intended to displace the powers of the gram sabha”, Krishna said. If Choudhury targeted the PMO and the Environment Ministry for their “continuous attempt to empower bureaucrats and bypass citizens' rights, even those enshrined in law in the FRA”, Ramesh explained how the Environment Ministry's order of 2009, which spelled out FRA's requirements of gram sabha consent and completion of recognition of rights before diversion of forest land, is “under systematic attack”. The convection also saw speakers criticising the NDA for coming up with the Compensatory Afforestation Fund Act (CAMPA), saying it allows the forest Department to bypass the authorised Gram Sabha under the FRA. A recent report said, a series of official letters exchanged between the Ministry of Tribal Affairs (MoTA) and the Ministry of Environment indicates how the NDA government is in a clear mood to sidestep the provisions of FRA in order to permit private underground mining in forest areas. The letters, written between June 2015 and December 2015, document how MoTA said that gram sabha’s informed consent was necessary for any diversion of forest land towards industrial projects, while the Ministry of Environment was adamant on diluting it. Thanks for your report on the convention we organised. Instead of linking to scribd, can you link to our press note athttps://forestrightsact.com/2016/05/04/cpm-mp-reveals-new-proof-of-nda-govts-attack-on-forest-rights-at-national-convention-against-illegal-takeover-of-forest-land/ ? There is an explanatory note linked from there along with a timeline that will help make sense of the documents. Have taken your link at the end.